Real Estate Development guru, Zad Roumaya, is systematically renewing Dallas' Urban Core. With a passion for green living and transforming previously abandoned or rundown environments into unique, cutting edge live/work spaces, Mr. Roumaya's company, Buzzworks is on the forefront of a green revitalization of the downtown area. 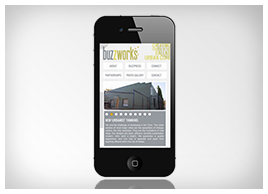 Artistry Labs has seen this firsthand, having occupied and enjoyed one of Buzzworks' first spaces for several years. Artistry came alongside Buzzworks to create a brand that communicates the company's passion for renewal as well as the abounding opportunities for collaboration and partnership. Rich photography is the focal point of the site, including before and after photos, and up-to-date information and images of upcoming projects. 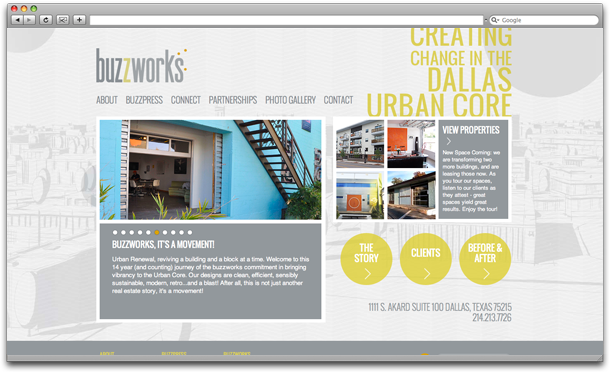 Ultimately, the vision of Buzzworks is to create terrific living, working and hybrid (live/work) spaces that perpetually meet the needs of residents and businesses alike.